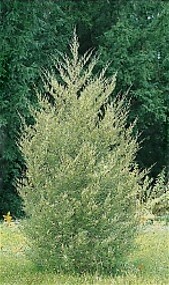 A dense pyramidal evergreen growing to 40 to 50 feet. Spread 8 to 20 feet. Medium green needles are flat and scale-like. Exfoliating handsome grayish to reddish brown bark is considered part of its ornamental interest. Native from northern Florida to Canada and west to the Rocky Mountains. Should grow in almost any soil and does well in poor gravelly soils. Due to its fast, dense growth, this tree is a good choice for an evergreen screen or hedge, space 4 feet apart. No shipments to CA.